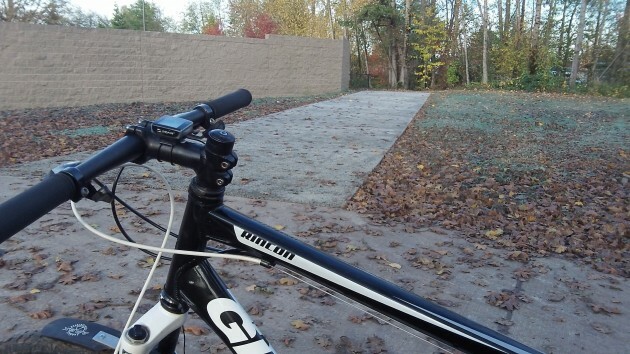 Albany’s Periwinkle Bike Path has a new extension, thanks to Lowe’s. The path offers a shortcut of sorts, and I sampled it on Friday afternoon. Albany has a system of 53 miles of bike lanes and nine miles of bike or “multi-use” paths, according to the Albany Bicycling Map. The newly paved path adds 0.14 miles to that system and runs between Periwinkle Creek and the eastern side of the new Lowe’s home improvement center at Oak Street and Ninth Avenue. The path extends the Periwinkle route northward, making a straight shot to Ninth. That saves people coming from the south the trip around Lowe’s parking lot and past driveways on Oak and Ninth, or through the parking lot itself. Why would people be going that way to a dead end on Ninth? Well, they can hang a right on the sidewalk and reach the shops and offices in the Periwinkle Plaza on the other side of the creek, or perhaps have to a meal at Arby’s. Lowe’s constructed the path and the wall separating it from the back of its store. I didn’t come across any other path users Friday on that short stretch, but unfortunately someone had already left behind some trash. Maybe Lowes will do another service to the community by attempting to keep it up. Maybe they can prove they carry solvents other can use and purchase them at Lowes. And it is up to the citizens of Albany to assist too. Tagging nonsense is akin to dogs spraying their territory and those doing such are no more than loose animals. At least this is not a so-called bikepath put in for funding and never kept up. Not enough citizens actually attempt to ride these paths that are seldom swept by road departments that cover them with gravel (from icy times) and trash. Following cold weather departments should quickly sweep the edge (bike path area) of our roads. Especially next to the Lowes that so many guaranteed would never be built. Will they apologize and thank all those who made it happen? Not likely. Why is the wall even necessary?